It was free. My daughter rescued it off her friend’s truck that was headed to the thrift store. The stool is one that I cut down to fit and I painted it to match. The phone is a favorite toy. I found it at a thrift shop. The little cabinet on the wall I found at a habitat for humanity store and I painted it to match. I put in a new window and framed it in. I just haven’t made the curtains yet. Their Grandpa is home from Iraq for a visit. I would love to have seen your husband's face when he walked in and saw all the things you've done since he was home last time. Wow, it looks great! What a blessing to be so thrifty and handy! I'm sure all of your grandchildren will love it! A D O R A B L E! And great that your hubby is home for a visit. You truly are amazing! I love all the details. You put the rest of us Grandma's to shame...this is AMAZING!!! Glad your hubby is home! I can't get over how fast you got it done! It looks amazing. I second the opinion that YOU deserve "The Grams Of The Year Award" !!!!!!!!!! Congratulations on the room and have a great visit! Completely incredible, Janis. You are the best Grams EVER!!! That checkered floor is to die for! Best Grandma EVER!! This totally beats the futons at my moms. Everything is so cute, I love all the accessories! Oh girl, you are the BEST! Look at that darling room all decked out for the grandbabes! What a wonderful Grandmother you are! I bet they want to be at your home more then their own! LOL! The room turned out so cute! It should be in a magazine! Woot! What a happy place for kids of all ages. When can I come? I love that wonderful room. Glad your Hubby is home. How is that finger. I still can't believe how awful that looked. I think your room is so special. I'm not a big fan of red, but you're starting to convert me! I love all of the details and thought you put into it. Last but not least, I love that all the dolls are naked...as they inevitably all end up anyway! :) Great job Grams! P.S. I also love the placement of the CTR sign. It kind of has a cryptic double meaning placed where it is...like it applies to the bunk beds. Choose wrong and the mattress will swallow you whole! Muahahahaha! Hehe Ok, I'm a dork, I know. Great room though! What a wonderful room. Your grandchildren will one day tell their grandchildren about this amazing room their grandma designed for them. Every inch of it is so stinkin cute! The room is great. The hours of labour so great! so much time, so much effort all in the name of love for your grand kids! Enjoy! I think this is seriously the cutest room ever. I love it from top to bottom, the colors, the furniture, everything. So dang cute Janis!!!! That room came out so cute! You did a great job, it must be so much fun to go to Grandma's house! I love the reds and white and its amazing what you can get with a little sugar from a Marie Callender's Pie!! I just want to know what hubby's reaction was to all the wonderful changes you have made to the house. I am so happy for you that he is home for awhile. The room is so amazing, I hope I can be just 1/4 of the Grandma that you are to all your halves. Fantastic job Grams of the Year... you have my vote. my goodness you are amazing!! PLEASE come visit my neck of the woods, I'll gladly let you overtake and redo to your hearts conent! I just happened onto your blog, and wow, you can adopt me any ole time. We moved from Magna a little over a year ago to Denver. 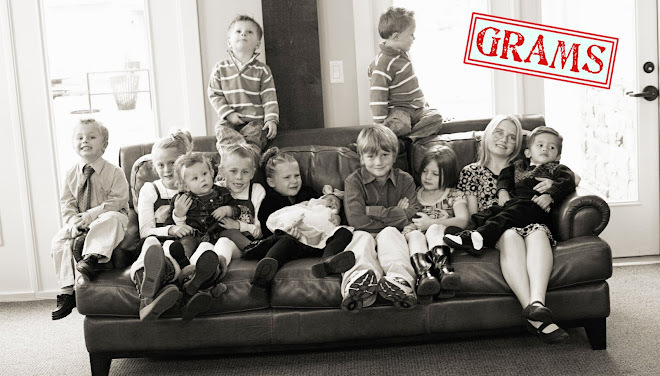 We have 8 children and 9 Grand's. You did an awesome job on that room. I will be dropping over more often now to see what you are up to. Don't know how I managed to miss this post earlier! What a fun room! You continue to amaze me! I have a doll just like yours! If we'd met a few years earlier we could have played with them together. I still have some clothes that my grandma made for it too. Guess I should get it out for my grands to play with. OH MY STINKIN' STARS!!!!!!!!!! I wish you were my Grandma!!! LOVE IT!!! Thank-you for sharing all the wonderful things you do! You sure do seem like a fun grandma! I love your sleep over room! What a creative person you are!